- Desintegrarse, consumirse por un calor abrasador. - The old satellite re-entered the atmosphere and burned up. 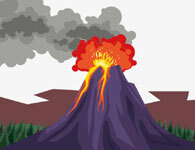 - Anything getting very near to an active volcano, would simply be burned up.